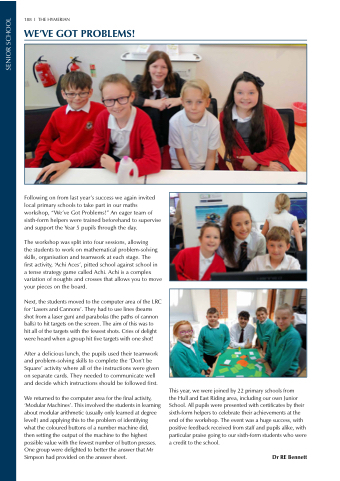 Following on from last year’s success we again invited local primary schools to take part in our maths workshop, “We’ve Got Problems!” An eager team of sixth-form helpers were trained beforehand to supervise and support the Year 5 pupils through the day. a tense strategy game called Achi. Achi is a complex variation of noughts and crosses that allows you to move your pieces on the board. hit all of the targets with the fewest shots. Cries of delight were heard when a group hit five targets with one shot! After a delicious lunch, the pupils used their teamwork and problem-solving skills to complete the ‘Don’t be Square’ activity where all of the instructions were given on separate cards. They needed to communicate well and decide which instructions should be followed first. We returned to the computer area for the final activity, ‘Modular Machines’. This involved the students in learning about modular arithmetic (usually only learned at degree level!) and applying this to the problem of identifying what the coloured buttons of a number machine did, then setting the output of the machine to the highest possible value with the fewest number of button presses. One group were delighted to better the answer that Mr Simpson had provided on the answer sheet. the Hull and East Riding area, including our own Junior School. All pupils were presented with certificates by their sixth-form helpers to celebrate their achievements at the end of the workshop. The event was a huge success, with positive feedback received from staff and pupils alike, with particular praise going to our sixth-form students who were a credit to the school.